This is one of the earliest Canadian examples of a transportation token. 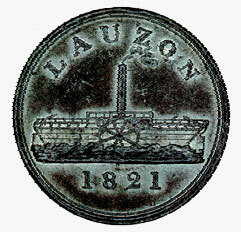 The vessel on the token is the Lauzon, a 310-ton steam-powered side-wheeler. It was built and owned by John Goudie. The first steam-propelled vessel to make regular crossings of the St. Lawrence River between Quebec City and Levis, the Lauzon operated daily from 5 a.m. to 9 p.m. between 1817 and 1828, making as well an occasional trip to Montreal. The side of the token not illustrated bears the French legend BON POUR HUIT SOLS around the perimeter; the English legend is in three lines in the centre and reads FOUR PENCE TOKEN. In 1821, when the tokens were first issued, this was the cost of a passage between Quebec City and Levis, a trip that usually lasted 10 to 15 minutes. In addition to transporting passengers, the ferry also carried merchandise at a fixed tariff between Quebec and Levis. The token was struck in lead and is slightly larger than a Canadian 25-cent piece. It is part of the National Currency Collection, Bank of Canada.